Like all branches of institutional investing, university endowments require individuals with an insatiable appetite for knowledge. It takes high-achieving and seasoned investment professionals to successfully perform manager sourcing, comprehensive due diligence and monitoring. By ensuring long-term prosperity, endowments are able to foster the next generation of leaders and chief investment officers. 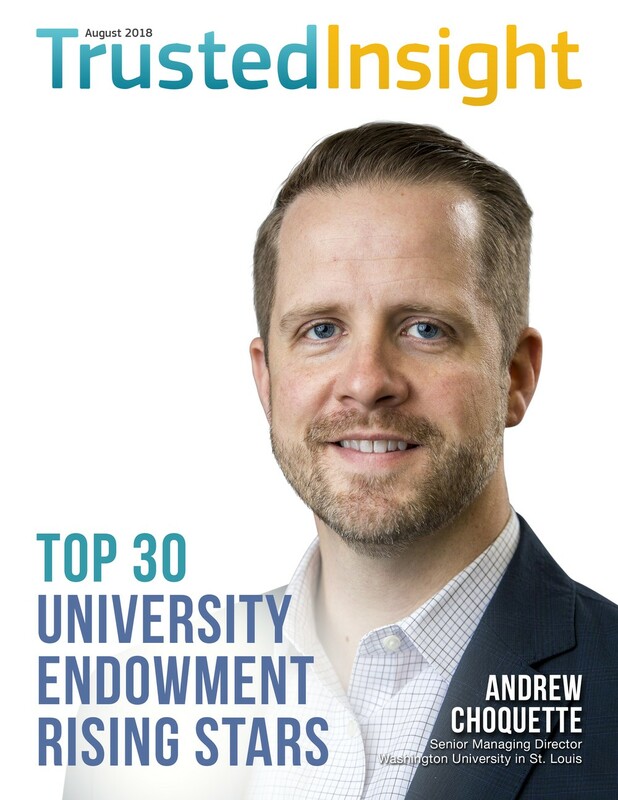 This list highlights 30 individuals that have pledged to produce strong investment returns that reinforce the missions of their respective universities. Jim Millar is a managing director at Princeton University Investment Company (PRINCO), where he joined in 2008 to lead efforts in private equity. Prior to joining Princo, he spent over two decades in the venture capital industry investing in early-stage technology companies. Jim is a past chairman and president of the Mid-Atlantic Capital Alliance and a former member of the NASBIC Board of Governors. He began his career as a systems engineer designing microprocessors at Texas Instruments. Millar holds MBA from The Wharton School of the University of Pennsylvania and a B.S. in engineering and applied science from Yale University. He has been a frequent guest lecturer at Princeton University, Stanford University and the University of Pennsylvania. Susan Chen is a managing director at the University of Texas and Texas A&M Investment Management Company (UTIMCO), a $45 billion endowment. In her role, she oversees investments within public equities in developed and emerging markets and technology-related venture capital. Previously, she was a managing director at a multi-strategy firm affiliated with Highbridge Capital, where she worked on distressed debt, private loans, event-driven equity and special assets. Chen holds a JD and MBA from Harvard University and a B.A. in economics from Harvard College. Joanna Rupp is the managing director at The University of Chicago Office of Investments, where she manages the $1.1 billion private equity portfolio for the university's endowment. She joined the University in 2001 as the manager of public equities and has held senior roles since then. Before that, she was a vice president with Security Capital Markets Group where she was responsible for structuring real estate transactions for institutional investors and providing investment banking services to affiliated companies. Rupp holds an MBA in finance from the University of Chicago Booth School of Business and a B.S. in business administration from the University of Kansas. She is a Chartered Financial Analyst and a Kauffman Fellow, Class 21. Edmond Fong is the senior managing director of absolute return at the University of California, Office of the CIO, which he joined in 2010. In his role, he manages the hedge fund portfolios for three separate pools of capital (the UC Retirement Plan, General Endowment Pool and Total Return Investment Plan) that make up a large portion of the overall Regents’ $119 billion in AUM. In addition, he is the product leader for the UC General Endowment Pool. Prior to joining the UC, he had acquired over a dozen years of direct investment experience across a variety of asset classes including: public and private equities, credit and structured products. His credentials include a B.S. from Carnegie Mellon University in industrial management and an MBA from the University of Chicago. He is also a CFA Charterholder. Melanie Davis is the managing director at University of Virginia Investment Management Company (UVIMCO), where she is responsible for credit and marketable alternative investments. Previously, she was head of alternative investments, equity and external mandates at AIG. She has 15 years of experience in fixed-income markets, specializing in structured products, and led U.S. structured products at AIG. Davis holds an MBA degree in finance from the Stern School of Business at New York University and a B.A. in economics from Tufts University. She is a Chartered Financial Analyst. Kavita Nayar is an investment manager of private capital at Duke Management Company (DUMAC), the endowment arm of Duke University. Previously, she worked for 11 years at Goldman Sachs in London and New York and was a vice president at Goldman Sachs Asset Management. Nayar holds a master's degree from Yale University and a bachelor's degree from Stanford University. Andrew Choquette has been a senior managing director at Washington University in St. Louis since January 2018. Previously, he was the interim chief investment officer and director of investments at Grinnell College. Prior to that, he held strategy and senior roles at Nike and Samsung Electronics and managed long/short equity and event driven hedge fund investments for Credit Agricole. Choquette holds an MBA in international business, finance and social enterprise from Northwestern University-Kellog School of Management and a B.A. in economics from Grinnell College. Harisha Koneru Haigh is a managing director of private investments and real assets at Northwestern University. Before joining Northwestern in 2005, she was a principal at PPM America Capital Partners and an analyst at ABN Amro. Haigh received an MBA in strategy and finance from Northwestern University, Kellogg School of Management and a bachelor's degree from Washington University in St. Louis. Brian Johnson is a managing director at the University of Southern California Investment Office, where he focuses on natural resources, real estate and emerging markets. Previously, he was a director at the University of California Regents and an investment officer at SDCERA. Johnson holds an MBA from The University of Chicago-Booth School of Business and a B.S. in finance from San Diego State University. He is also a Chartered Financial Analyst. Thomas Scriven has been a managing director at the University of Pennsylvania Office of Investments since 2015. In his role, he manages the private equity investment program for the University’s endowment and pension plans. Previously, he was a principal director and partner at H.I.G. European Capital Partners, a leading global mid-market private equity firm he helped found. Throughout his career, he has sat on numerous boards of companies in the industrials, media, environmental services and building products industries. Scriven holds an MBA from Harvard Business School and an AB from Princeton University. 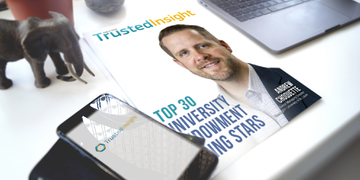 Jakob Widmark is an investment manager at the University of Minnesota's endowment office, where he is responsible for sourcing and conducting due diligence on opportunities across a range of strategies within the private and public markets. Before joining in 2014, he was an investment analyst in the pension investment group of ATK, an aerospace and defense company. Widmark holds an MBA and a bachelor's degree in finance, both from the University of Minnesota, and is a CFA Charterholder. Brian Graeme is a senior investment associate of private strategies at Oklahoma State University Foundation. He is tasked with reporting to the chief investment officer, and sourcing and evaluating private investments. Previously, he was a global tactical asset allocation analyst at Messenger Advisors and a partner family specialist at Crow Holdings Capital. Prior to that, he actively invested $2 billion in assets in the technology sector across small, smid and mid cap stocks on behalf of institutional clients. Graeme holds an MBA from The University of Texas at Austin-Red McCombs School of Business. Pasy Wang is the senior managing director of investments for Caltech's Investment Office, which oversees $3.3 billion in assets. She joined Caltech in 2010. Prior to Caltech, Pasy co-managed a portfolio of opportunistic hedge funds for Pacific Alternative Asset Management Company (PAAMCO), a leading investment firm for institutional investors. Previously, she was a consultant at Deloitte Consulting covering the automotive industry. Pasy is a graduate of the University of California, Los Angeles with a B.S. in electrical engineering. She also holds an MBA in finance from Columbia Business School. Sarah Samuels has been a managing director at Wellesley College since September 2017. Previously, she was the deputy chief investment officer at Mass PRIM, where she focused on asset allocation and manager selection across asset classes. Prior to that, Samuels was an associate portfolio manager at Boston Advisors and a relationship analyst at Wellington Management Company. Samuels holds an MBA from Boston University’s Questrom School of Business and a B.A. from the University of New Hampshire. She holds the Chartered Financial Analyst and Chartered Alternative Investment Analyst designations, sits on the University of New Hampshire Board and the CFA Boston Society Board, founded the Boston chapter of Private Equity Women in Investments, and was a founding Advisory Board member of Girls Who Invest. Allen Huang is the director of investments at Michigan State University (MSU), where he is an integral member of a 3-person investment team. Previously, he was the director of fixed income at the Indiana Public Retirement System, a public pension fund with $30 billion in assets. Prior to that, he was an assitant vice president at Barclays Capital. Huang holds an MBA in finance from the University of Southern California and a B.S. in finance from Northeastern University. He holds a Chartered Alternative Investment Analyst designation. Jaime Aguirre is the investment director of private equity at Rice Management Company. Previously, he was a principal at Austin Ventures and a vice president in the technology, media and telecom investment banking group at Goldman Sachs. He currently serves on the board of Accelerate Learning, Austin Children's Museum, Burrell College of Medicine at New Mexico State University, Emerus Hospital Partners, Iora Health and OrderWithMe. Jaime received his MBA from Harvard Business School and a master's degree and BBA in accounting from the University of Texas at Austin. Paul Lawrence is the managing director of investments and assistant treasurer at the University of Pittsburgh, where he oversees the university's $3.9 billion endowment. He joined the university in 1997 as a senior financial analyst and analyzed alternative investments and investment managers. Lawrence holds an MBA in finance from the University of Pittsburgh Katz Graduate School of Business and a B.S. in finance and accounting from Penn State University. Tianhao Wu is the director of investments at The Rockefeller University, which has a $2.2 billion investment portfolio. He focuses on asset allocation and manager selection primarily overseeing public equities as well as Asian public and private investments. Prior to joining Rockefeller in 2014, he worked at Analytical Research, an investment consulting firm, where he helped advise European corporate pensions and endowments on hedge fund investments. Tianhao received his master's degree in financial engineering from Cornell University and dual B.S. degrees from the University of Michigan and Shanghai Jiao Tong University. He is a Chartered Financial Analyst and Financial Risk Manager charterholder. Keith Rohr has been an associate director of investments at the Case Western Reserve University since 2012. He is responsible for supporting the chief investment officer and investment directors with sourcing, monitoring, due diligence and analysis for all asset classes in all portfolios Previously, he worked as a research analyst at Highland Consulting Associates in Westlake, Ohio. Rohr holds an MBA from the Weatherhead School of Management at Case Western Reserve University and a B.S. degree in business administration from The Ohio State University. He is also a Chartered Financial Analyst. Michael Bennett is the director of investments at Baylor College of Medicine, Endowment Arm, where he manages over $1 billion in assets. Previously, he served Boeing Co.'s asset management arm. Bennett holds an MBA from the University of Detroit Mercy. Jake Eld is the associate director of investments at the University of Oregon. He joined the organization in 2015 and works across several asset classes including global equities, fixed income, absolute return, hedge funds, private equity and real assets. Previously, he served as a vice president, commercial real estate portfolio member at Umpqua Bank and as a senior credit analyst at Summit Bank. Eld holds a BBA in finance from Idaho State University. Angela Clement is the associate director of investments at Grinnell College, where she assists with the management of the endowment fund's private investments, including buyout, distressed, venture, growth equity, invention capital, and real estate funds. She also oversees the legal matters of the investment office. Prior to joining Grinnell in 2007, she practiced law in the private sector for seven years. Clement holds a JD degree from the University of Virginia School of Law and a B.A from Central College. Jason MacDonald is the chief investment officer at the Rutgers University Endowment. Prior to joining Rutgers in 2016, he was a senior portfolio manager for private markets with the New Jersey Division of Investment. In that role, he was responsible for investing the division's $20 billion alternative investment portfolio and managing the underlying portfolio team. He began his career at the division as an analyst within the private equity group. MacDonald holds an MBA in finance from St. Peter's College and a B.S. in environmental business economics from Rutgers University. Sara Orr is the director of private equity at Bowdoin College Investment Office. She joined the organization in 2012 and has held titles such as investment associate and associate director of private equity within the organization before taking on her current role. She is also an ambassador at Girls Who Invest Inc., a non-profit organization dedicated to increasing the number of women in portfolio management and executive leadership in the asset management industry. Orr holds a B.A. in English and French from Bowdoin College. Matthew Mongon is a senior investment analyst at Lehigh University. Before joining Lehigh in 2011, he served as the director of investment research at the consulting firm Molewski Financial Partners, with $2 billion in assets under management. He has also held the title senior consultant in the firm's investment consulting group. Mongon holds a B.S. in economics and finance from The Wharton School, University of Pennsylvania. He is a Chartered Financial Analyst and member of the CFA Society of Philadelphia. Stacy Daher is the associate vice president of finance and treasury at the University of San Francisco. She has held leadership roles since joining the University in 2002. Previously, she served as a senior associate at PricewaterhouseCoopers, where she served large audit clients within higher education and the technology space. She is currently a governor appointee for the California Educational Facilities Authority. Daher holds a master's of accounting from Saint Louis University and a bachelor's degree in music from the University of Missouri-Columbia. Mark Waite is the director of endowment investments at the University of Utah, where he is responsible for evaluating investment opportunities and supporting the overall portfolio strategy. Previously, he worked in corporate finance working at various Utah companies as an audit manager, director of finance and corporate controller. He has also spent time at Smith Barney managing private client accounts as a wealth manager. Waite holds a B.S. in accounting from the University of Utah and is a licensed Certified Public Accountant. Paul Mace is the director of investments at Tufts University in Boston, Massachusetts. Prior to joining Tufts in 2004, he was a senior associate at Regent Associates International. He is currently a board member at the Institutional Limited Partners Association (ILPA). Mace holds an MBA from the F.W. Olin School of Business at Babson College and a B.S. in business administration from Trinity University. Joshua Beitzel is the director of investments at Denison University, where he evaluates investment opportunities for the portfolio and implements the overall portfolio strategy. Previously, he was a senior investment analyst at Graystone Consulting, where he advised institutional clients as a fiduciary. Beitzel holds an MBA and a bachelor's degree in business administration from Mount Vernon Nazarene University. Amy Miller is an investment manager for the Drexel University and the Academy of Natural Sciences' endowments. She is responsible for manager sourcing, due diligence and monitoring. She has over 18 years of experience in financial services, 12 of which have been focused on private markets as a portfolio manager, consultant and an investor relations professional. Previously, she was a vice president of investor relations at LBC Credit Partners, where she was responsible for fundraising, marketing and limited partner relationship management. Prior to that, she was a vice president of investment funds at Camden Partners, where she co-managed four fund of funds vehicles with investments in venture capital, real estate, private equity and real assets. Amy holds an MBA in finance from Temple University-Fox School of Business and Management and a B.A in mathematics from Millersville University.